Brock Business Administration students (from left to right): Kagetha Namasivayam, Professor Francine Vachon, Billy McPherson, Chase Harder, Collin Miller, Riley Finucan, Benjamin Guay-Marceau and Alex Joseph. November 2018 – BROCK Information Systems and Information Technology Students teamed up to work on a community partnership project with Welland Toyota again this year. The project involved Goodman School of Business students who came into the dealership to research our service department in order to understand scheduling, data management and software capacity. They then spent the term developing an information system app based on the needs of this sector. 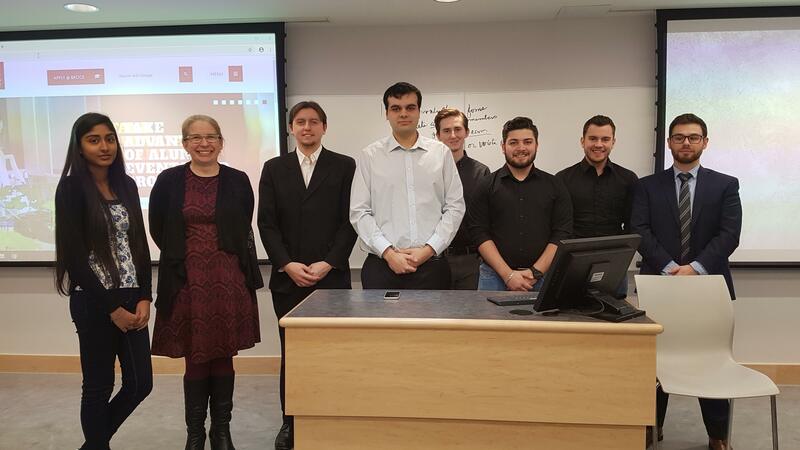 The app was successfully presented at the final of the first term before the class and Professor Francine Vachon. Welland Toyota is once again happy to participate in this Learning Partner initiative by Goodman School of Business which allows students to work with various Niagara businesses for case studies and assignments. Congratulations to the team!